Unfortunately, if you look at the list of best sellers in Amazon, you might see undermounted, accessory-poor, and optically terrible telescopes like the $60 Celestron 21035 70mm on the top. They are enthusiastically reviewed by newbies who have never used an another telescope in their life and are happy to see some craters on the Moon and Jupiter’s moons – something a decent pair of binoculars can do. Fortunately for you, we’re not basing Amazon best seller list for our recommendations! To give you a heads up, you can order decent telescopes ranging from $100 to a half million dollars. If your budget is below $100, we would highly recommend you to either settle for a 50mm binocular or save up some more money. Before reading our telescope recommendations, we hope you have a budget set on your mind. Around 70% of knowledgeable telescope buyers spend between $100 and $500 on their first instrument. If you’re looking for a decent experience as a beginner, settle for something between $125 and $250. If you want to have a serious instrument that will last a lifetime with no corners cut, plan on spending $275-$450 or more. It’s the range we consider where better telescopes start where you’ll have fewer corner cuts. For every $100 increment in your budget, your stargazing experience and the optic details will increase multifold. So remember that while deciding if you have a flexible budget. If you live in the city, you will especially want to prioritize aperture as a small telescope will show very little under severe light pollution. That being said, dark skies still beat anything, so you should make an effort to get to the countryside whenever possible. Go on. Read our reviews on best telescopes available. The universe is waiting for your glance. For those who must save every last dollar, the Zhumell Z100 is more or less the cheapest astronomical telescope one can buy that is actually useful. There are a handful of <$100 telescopes that are in fact usable, but one would find them quickly boring and useless as any less than a child’s toy – a pair of 7×50 binoculars is probably better. While lacking many features of a high-tech telescope, the Z100 is perfect for kids, college students and other newbies to the night sky. We compared Zhumell Z100 to some of the competitors that belongs in the same price class. Orion SkyScanner – Z100 offers better optics and has a built-in handle. The Z100 doesn’t have a collimatable primary mirror like the Lightbridge Mini 114, which is our next recommendation, and it’s a bit smaller, so the views aren’t quite as good. If one ends up with a unit where the primary is severely far out of collimation, you may have to return it to get good views. Also, the eyepieces supplied with the Z100(10mm and 17mm) are very inexpensive, and the 17mm is a little too high in magnification for a low-power eyepiece, and by the time one upgrades you’ve spent the money needed for a Mini 114 or even better scope. The Z100 makes up for these flaws with a rather unique attribute – the entire Dobsonian base has a ¼ 20 threaded hole at the bottom, so you can put it on a sturdy photo tripod. The company, Zhumell, is famous for their Dobsonian base telescopes, with Z100 being the smallest in the line. Also, the entire scope weighs only a hair over 5 lbs – half that of the Mini 114. There’s even a nice built-in handle attached to the side of the mount. In situations where one needs an extremely portable and convenient telescope, and you don’t have a table, the Z100 is your best bet. All things considered, the Z100 is a great choice if you’re curious about sky watching but not willing to shell out a few hundred dollars for your first model. So what do you say, Copernicus? Are you ready to buy your first telescope? Our budget pick for the price range of $110 to $170. This scope has absolutely ridiculous value for its price range. The Mini 114 offers an extremely wide field of view – 3 degrees with the included 25mm eyepiece and up to 3.7 degrees with an additional wide-field eyepiece – big enough to fit even the biggest deep-sky objects in the sky such as the Pleiades, and making it easy to find almost anything even with the simple included red-dot finderscope. The included red-dot finder is the weak link of the scope, and you may want to replace it with a Rigel Quickfinder down the line. The Mini also has fine optics, taking the 50x provided by the supplied 9mm eyepiece with ease and being capable of up to 200x with a shorter focal length eyepiece like a 6mm goldline, which you can buy separately if needed. Don’t feel bad about spending a lot on extra accessories – they’re worth it with this scope. The scope also includes a 26mm (17x) eyepiece. The telescope’s optical tube comes with a Vixen-style dovetail with ¼ 20 holes, meaning it can be used on an equatorial mount or photo tripod if one desires – the latter does require some kind of slow-motion adapter for the precision necessary for astronomical use. At only 10.8 pounds, the entire telescope fits in a backpack and can be brought on an airplane. 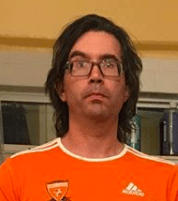 Celestron Astromaster 70 EQ – Not great eyepieces. Could experience vibration. Orion Starblast 4.5 – Similar to Meade Lightbridge Mini 114, but has narrower view field and more coma. You’d be able to have a good look at the open star clusters, Orion Nebula, Andromeda Galaxy, Saturn’s rings and its separations with Mini 114. If you’re looking for the most technologically advanced telescope on the market, this isn’t it. If you just want an easy way to catch the next meteor shower, however, say hello to the Meade Lightbridge Mini 114. 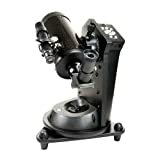 The Zhumell Z130 used to compete with the Meade Lightbridge Mini 130, but sadly the 130 has been discontinued and the Z130 is now the only Amazon-available 130mm tabletop Dobsonian in the United States. The extra half inch of aperture is a noticeable improvement compared to 114mm scopes, but it comes at a cost – both financial and practical. Z130 is also comparable to AWB OneSky. Z130’s closed tube rings, better contrast and focuser gives it an edge over OneSky. OneSky’s exposed mirrors aren’t favored by people with kids, either. The Z130 is in many respects a scaled-up Z100(our <$110 recommendation), with the only differences being a collimatable primary mirror, no ¼ 20 hole, and very fancy rotating tube rings. These tube rings allow one to rotate the tube to the most comfortable position and balance more easily with heavy eyepieces. Unfortunately, the Z130 is in a weird “no-man’s land”. It is still a tabletop telescope, and is too short to put on a milk crate or the like. However, its 21 lb weight means that you will need to put the scope on something like a concrete ledge or make a custom tripod for it – the former being annoying and the latter being costly. A table will simply not be steady enough most of the time. The red-dot finder for aiming works well and if you want, you can easily upgrade to Telrad finderscope. Z130 comes with 25 mm and 10 mm eyepieces, giving a magnification of 25x and 65x respectively. We’d recommend you to get one more eyepiece, preferably 4mm Planetary or 6mm goldline, to view the planets in high resolution. It’s the same story for all telescopes in the 130mm range. Z130 outperforms the competitors, though. The Orion XT4.5 is based on the same 114mm f/8 optical tube often sold on spindly mounts at big-box stores, but unlike those, it comes on a steady, easy-to-use Dobsonian mount, and with great accessories. The XT4.5 comes with 25mm and 10mm Plossls eyepieces, which are of high quality. As with almost every telescope on this list you may want additional eyepieces for very low and very high power. Thanks to its long focal ratio, the XT4.5 will have a sharper view at the edge of the field at low power as there is less coma. Furthermore, the secondary mirror is smaller and thus affects the image less. Finally, the longer focal ratio makes collimation easier – I had an XT4.5 that I only needed to collimate every dozen viewing sessions. Due to the long tube, the XT4.5 is better suited for a milk crate or tall box than a table. This can be a little annoying, but the improvements over a smaller 114mm tabletop scope are worth it. But for around $25 more, you can get a 6” Dobsonian, which leads me to our next entry. One of the high rated for Hobbyists. Before the 1980s, a 6” telescope was considered the pinnacle of what the average amateur astronomer could buy. However, light pollution and cost decreases have lead to a 6” today being considered more or less the minimum sized-telescope for real, serious observation. A 6” can show you a lot – I spent my first two years of astronomy with one. A 6” telescope can take up to 300x with good optics and collimation. It can show you Neptune’s moon Triton, the entire Messier catalog even in the suburbs, lots of detail on Mars, Jupiter, and Saturn, and – under dark skies – even Pluto and the spiral arms of M51. The 6” Traditional is more or less a modernization of the 6-inchers of old – a gleaming white tube with a 6×30 finderscope, rack-and-pinion focuser, and f/8 focal ratio. An amateur in the 1950s or 1960s would easily recognize it. The only difference is that it is mounted on a Dobsonian mount. The 6” Traditional includes a decent 6×30 finderscope, though you may want to supplement it with a Telrad or Rigel Quickfinder for easy location of objects. The included 25mm and 10mm Plossls are good but as with other telescopes you may want to get additional eyepieces for low and high power. The 2” focuser of the 6” Traditional also allows for heavy, wide-field low-power eyepieces, unlike every other telescope below its price. While the Traditional’s 48” long tube may sound like a monstrosity, it easily fits across the back seat of most vehicles. The tube easily separates from the mount, so the 33-lb weight of the telescope isn’t really even a problem. It’s a lot to take in, right? But this is one of the reasons that the SkyWatcher S11600 is ranked so highly among Dobsonian telescopes. An 8” telescope will show even more than a 6”. The entire Messier catalog is relatively easy from a suburban or dark site. Pluto may be spotted from reasonably dark skies, and many deep-sky objects begin to show fair amounts of detail. The moons of Uranus are possible sights on nights of steady air. Having the same tube length as the aforementioned 6” Dobsonians, the 8” Traditional is no more bulky than them. The only difference is the weight. For older users or children, an 8” may be far more difficult if not impossible to set up without assistance. That being said, a typical person of average height and strength can easily handle an 8” Dobsonian, and the gains over a 6” are certainly worth the price. A 6” telescope can show you enough to last years – an 8” is enough for a lifetime. Did you like the accessories of the 8” Skywatcher but want even more? The Zhumell Z8 is bursting with value. For starters, there’s the 2” dual-speed Crayford focuser. A regular Crayford is already awesome, but the Z8’s dual-speed one takes things to the next level. Even at very high power, focusing is a breeze. The Z8 comes with a 30mm wide-field eyepiece instead of a 25mm Plossl. I normally recommend getting a 30mm wide-field to accompany Dobsonians with 2” focusers, and Zhumell has already filled this slot for you. You’ll probably want a medium-power eyepiece of, say, 15mm focal length to accompany it. The included 9mm Plossl is decent for high power. The Z8 comes with a 9×50 right-angle finder like the Sky-Watcher 8” Collapsible, and even a DC-powered cooling fan for cold nights when you’ve kept the scope indoors. The laser collimator included with the Z8 is usually misaligned, and alignment is a very complicated process. However, you don’t need a laser collimator with most Dobsonians and the Z8 comes with so much other good stuff this minor inconvenience really isn’t an issue. Apart from the Meade Mini 114, the Z8 is the telescope I most often recommend to beginners. It is the best 8” Dobsonian available and nothing beats the sheer value in its price range. Included laser collimator is useless, but who cares? An upscaled version of the Z8, the Zhumell Z12 offers colossal light-gathering power. A generation ago a scope this big was something only a professional or very rich amateur could own! A 12” Dobsonian easily shows Pluto, resolves many globular clusters, and shows detail in many galaxies – even from the suburbs. Jupiter’s moon Ganymede may show a slight dark marking – Galileo Regio – to a well-trained eye. Uranus and Neptune’s moons are easy even under so-so conditions. Weighing 75 lbs, the Z12 is not a lightweight telescope, and its 14” wide tube is rather awkward to carry. You can solve the tube issue with homemade or aftermarket straps, or simply put the whole scope on a hand truck or dolly. That being said, the Z12 will still fit in most sedans and SUVs, though compact car owners may be in trouble. We’d recommend getting a smaller scope to complement the Z12, both for nights when it isn’t worth hauling out the big scope and also to be sure you’re hooked before you welcome this beast into your home. But if you can afford and fit this scope, there is nothing like the power of a 12-inch Dobsonian. The vast majority of remotely affordable GoTo telescopes have 1990s-style hand controllers with tiny buttons, guzzle electricity, and have wobbly, plastic mounts. Celestron’s NexStar Evolution breaks that trend. With a built-in rechargeable lithium battery and the ability to control it with your smartphone, it brings GoTo into the 21st century. The Evolutions are Schmidt-Cassegrains with a focal ratio of f/10. This means it has a narrow field of view even at low power – the 6” Evolution has a field of view slightly smaller than a 6” Dob, while the 8” Evolution has barely over half the field of view of a 6” or 8” Dob. This is alleviated by the telescopes’ GoTo capability, but it does mean that some large objects such as the Orion Nebula can no longer be taken in all at once. Collimating Schmidt-Cassegrains is difficult in the field, requiring one to defocus a star and center the diffraction rings. While no problem for an experienced user, this can leave beginners scratching heads. While the Evolutions may not give you the most aperture for your buck, their high-tech features and compactness are more than enough to entice even big Dob owners into at least considering one. The below products are not over first choice in their respective price ranges, but they all are worth mentioning. 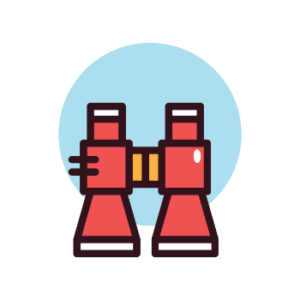 You might find some features in them that’s suitable for your use case. The Funscope Astro Dazzle 4.5 (what a word salad) is more or less a rebranded Mini 114 with a better red-dot finderscope and a vinyl tube wrapping with colorful (albeit unrealistic) photos of astronomical objects, and a free Moon map. Like the Mini 114, the Dazzle is capable of both very wide fields and high magnification, weighs only 10.8 lbs, and has a Vixen dovetail allowing it to be attached to other mounts. The vinyl tube wrapping is something unique to this telescope and something that no other manufacturer I know of has ever tried. In practical terms, it is slightly less cold and thus more comfortable to handle – a slight, although noticeable, benefit. Really, however, the bright, colorful images plastered on are meant to grab the interest of kids – a purpose it does do correctly. However, the images can set unrealistic expectations and an adult may get a little tired of how childish the telescope looks. The StarBlast II is yet another copycat of the Mini 114 (though the StarBlast, in fact, came first). It is unique in that it has an equatorial mount, and unique among cheap equatorially-mounted scopes in that the mount is actually steady enough for one to use it. The EQ mount is fairly complicated for a child or novice, but does mean you won’t need a table, and tracking by hand is easier. One can buy a simple motor drive from Celestron (it is compatible) which allows the mount to track the sky, enabling lunar and planetary photography with a cell phone or webcam-style CCD camera. Long exposures with a DSLR camera will put too much strain on the lightweight mount and the drive is simply not accurate enough for a time exposure. The StarBlast II also comes with Plossl eyepieces, which are an improvement over the modified Kellner designs almost every sub-$350 telescope usually comes with, and the same Moon map as the Dazzle 4.5. One of the most versatile telescope. While this scope has no Amazon reviews as of now due to the original listing being replaced (I have no idea why), rest assured that this telescope has many admirers and happy owners. The OTA is the same 90mm Maksutov-Cassegrain sold as the Celestron C90, Orion Apex 90, and the newer Meade ETX-90. Often compared to the Questar, these scopes are nearly perfect optically, need no collimation, are extremely compact, and make great spotting scopes during the daytime. It also comes with a certified safe solar filter, making it a telescope to observe sunspots during the day. The mount, after a simple alignment procedure, will track the sky. The f/14 OTA makes a poor choice for long exposures and the alt-azimuth nature and simplicity of the mount mean it is useless for deep-sky astrophotography (as is almost any mount under $1000). However, the long focal ratio and excellent optics of the Virtuoso lends it well to lunar and planetary astrophotography. You can also use the included solar filter to photograph sunspots, of course. The mount will also thread onto any photo tripod, and the OTA can be removed and the mount can be connected to a DSLR for panoramic and timelapse photography in the daytime. The included finderscope is useless – it can be replaced with a Daisy red dot finder or Rigel Quickfinder. The Orion XT6 Plus costs only $10 more than the regular XT6, so I’m going to omit the regular XT6 and focus on the Plus. The XT6 Plus is more or less a carbon copy of the Sky-Watcher 6” Traditional, with a red dot finder instead of a 6×30, cutouts in the mount, a strip of white reflective material on the base, redone paint, a 1.25” focuser, and thumbscrews for the secondary mirror. The thumbscrews are nice, but are of little need with an f/8 telescope since you’ll rarely need to adjust the secondary. In any case you can buy thumbscrews for the 6” Traditional. The XT6 Plus includes a Barlow lens, Orion’s DeepMap 600, and a solar filter. The Barlow is nice, but a quality short focal length eyepiece will prove superior. The DeepMap is a great map for out in the field, but modern phone apps and free computer programs like Stellarium will prove of equal or greater utility. The included solar filter is nice for viewing sunspots and is certainly worth the price. The only drawback of the XT6 Plus is that 1.25” focuser. The included accessories are certainly worth it, yes, but adding a 2” focuser requires at least $80 and drilling a larger hole in the tube. Without a 2” focuser, you’re not going to be able to get as wide of a field at low power since you can’t use 2” eyepieces. If you don’t need/want 2” eyepiece capability and want the included accessory bundle, the XT6 Plus is a fine choice. The Sky-Watcher 8” Collapsible uses the same optics and base as the 8” Traditional, but that’s where the similarities end. 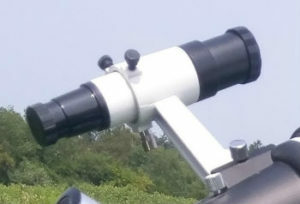 The 8” Collapsible not only sports a nice Crayford focuser like the Orion XT8; it comes with a well-made right angle 9×50 finderscope which is extremely useful in locating deep-sky objects. The Collapsible’s tube is, as the name implies, collapsible. It shrinks by about 12”, which means it can rest vertically in a car seat and fit in a typical sedan trunk, unlike a solid-tubed scope of this focal length. However, the open tube allows dew to reach the mirrors far more easily and lets light shine in, reducing the brightness and contrast of the view. This can be solved with a shroud made of Lycra or similar fabric which you can either buy or make yourself. Collapsing the tube will tend to cause the telescope to lose collimation, and even if left extended it may lose collimation more often, which is something to consider if you want your scope to be as low maintenance as possible. Also, somewhat bizarrely, the Collapsible actually weighs a few pounds more than its solid-tubed counterpart, but this is not a huge problem. If you need a slightly more portable 8” Dob and don’t mind the inconveniences of the collapsible tube, the Sky-Watcher 8” Collapsible is for you. 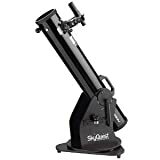 A good refracting telescope costs a fair amount of money, which is why every telescope (with one exception) cheaper than the Omni 102 I’ve recommended has been a reflector. Cheap refractors are often made short so as to require a smaller mount and smaller shipping box. This causes them to have more chromatic aberration – defocused purple rings around bright objects which smear the view. At a focal ratio of f/10, the Omni 102 has some slight CA, but it is not enough to noticeably hamper views. A 4” refractor will perform at a roughly comparable level as a 6” Dobsonian thanks to the lack of a secondary mirror and the higher transmission rate of lenses – a multi-coated lens lets about 99% of light hitting it through, whereas a typical primary mirror only reflects 90% of the light hitting it, meaning that with 2 mirrors you lose 19% of the light coming in to absorption. The Omni 102’s weight is comparable to an 8” Dobsonian, but it does break up into many pieces, making it not much trouble to set up even for a child or elderly user. However, the eyepiece tends to move more in height than with a Dob – meaning it may become inaccessible at times to children and often hurt one’s neck to reach. The Omni also only includes a single eyepiece (25mm Plossl), which is a bit of an annoyance. That being said, it has a 2” Crayford focuser so you can upgrade to a 2” diagonal and use 2” eyepieces at your leisure. The EQ mount is fairly complicated for a child or novice, but does mean you won’t need a table, and tracking by hand is easier. One can buy a motor drive from Celestron for around $125 which allows the mount to track the sky, enabling lunar and planetary photography with a cell phone or webcam-style CCD camera. Long exposures with a DSLR camera are difficult, but possible. Don’t expect much, though. If you must have a refractor, the Omni XLT 102 is one of the few I recommend at this price range. Keep in mind that an 8” Dobsonian will show more, however. How To Choose A Telescope? Things can get complicated when you’re ready to graduate from toilet paper rolls to real telescopes. The good news is that we’re here to help. If you’re in the market for a telescope, here are just a few tips for finding a model that will unlock the night sky and all of its secrets. There are several different types of telescopes, but the most common are refractor, reflector and compound. A refractor usually provides the best image for its aperture, but they’re expensive. They’re seldom available at large apertures. Inexpensive ones have a fair amount of chromatic aberration thanks to the two-lens achromatic design they use (more expensive scopes use exotic glass and/or extra lenses to deliver good color correction). Newtonians reflectors do require collimation, which isn’t really much of a hassle. The optical quality is fairly good, and the eyepiece is almost always in a convenient location when used on a Dobsonian mounting. On equatorial mounts they’re often worse than refractors. Schmidt-Cassegrains are compact and lightweight, but they don’t give much bang for your buck and collimating them is difficult. Maksutov-Cassegrains are compact, lightweight at small sizes, and have pretty good images, but they’re expensive, get heavy in larger sizes and not available at reasonable prices at large apertures, similar to refractors. Keep all of these pros and cons in mind as you go shopping for a telescope. You don’t have to be a technical engineer to buy an awesome telescope, but it certainly helps if you understand and appreciate things like aperture, focal length and maximum magnification. Do some research to learn what these things are and how they can help you when you’re tracking comets and identifying constellations. Remember, bigger isn’t always better. Smaller numbers can mean larger focus areas or greater fields of depth. Some telescopes come with built-in computer assistance for tracking and identifying celestial objects. But we don’t really recommend computerized GoTo telescopes over the manual ones that are on our recommendation list. They come with headaches like the need of power supply, cold-causing problems, extra setup time e.t.c. Actually, good star charts can work wonders for you, if you know what to do with it. Though if you have a budget of above $1000, you may opt for a GoTo telescope, just like what we recommended on the $1000-$2000 range. Ultimately, there’s no right or wrong answer when it comes to the level of technology that you’re comfortable with, so mull it over before making a decision. – What kinds of accidents are covered by the policy? Do they include human errors as well as product defects? – Who pays for return shipping if the device has to be sent back to the manufacturer? – How long does the warranty last? Can that coverage be extended with an extra fee? Telescopes can range from $20 toys to $2,000 tools. You’ll definitely want to take a look at your bank account before you start getting starry-eyed over a particular model or brand. Instead of going into debt to buy that huge magnification lens right this second, you can always save your money and replace a cheaper lens later. These are just a few things to keep in mind as you shop for telescopes. Whether you’re an avid astronomer at the local observatory or a simple college student looking for something to poke out of your dorm room window, these tips can help you make a smart purchase decision about your next telescope. Good luck getting the best rated telescope available! Selecting A Telescope Is All About You! Where will you use it? Where will you store it? How much weight can you carry comfortably? How will you find the things you want to see? Is this for home use or will you frequently put it in your car? Will you want to take this on vacation? Will you want to take it on an airplane? If your new scope is strictly for home use, can be kept in the house and bring it outside when you want to use it. However, if you can keep it in a garage or other ground level location then size and weight become less of a concern. You can consider a larger scope which will provide better views. Save that second, smaller scope, till later. If there are stairs involved to get the scope to the observing location, or you can’t handle a lot of weight, or travel is a priority, a smaller scope that will that fits into the “grab and go” category may be a better first scope. A big scope might be so cumbersome that it will never get used. If this is for your 10-year-old and they will be using it on their own, most of the time, let that govern the choice. Take into account their ability to manage the scope on their own. If it is a hassle to use, they won’t use it. Ultimately you will have to locate things in the sky. If you are willing to do your own hunting and tracking, like planning a trip using a paper roadmap, the manual scopes are for you. If you prefer to have the scope find the targets, like a GPS in the car, then look at the PushTo or GoTo computerized packages. Cheap telescopes under $100 are almost universally toys. Below $300 or so, many consumer telescopes tend to have some corners cut to reach a given price point. Remember, a telescope is meant to last a lifetime – don’t be afraid to spend a few extra bucks to keep yourself truly satisfied. How to Find the Andromeda Galaxy? How Much Does a Good Telescope Cost? As a planetary astronomer, I was working on the New Horizon project at Southwest Research Institute until mid 2016. Currently, I share my astronomical knowledge on this blog and I'm heavily into urban farming too.